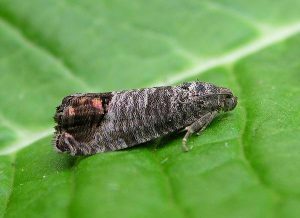 The Codling Moth, or Cydia (Laspeyresia) pomonella is an insect that primarily infests apples, pears, English walnuts and rarely cherries, leaving its excrement called “Frass”. Codling Moths have an extensive distribution all over the world. These pests can be found mostly in Northern America, Europe, and Southern Russia. A full-grown adult Codling Moth measures about ½ to ¾ inch long with spotted gray wings with brown tips, which shroud its body. The larvae are white to light pink color worm-like caterpillars with dark brown heads. The instar larva is 1/10 inches while a full-grown larva is ½ to ¾ inches. The eggs, which get darkened as they hatch, are tiny, disc-shaped and are usually deposited singly on fruits, nuts, leaves or branches. Comparing to the apples and pears, walnuts are not the most favored fruits of the Codling Moth larvae. Rarely, the larvae have been found in cherries, peaches, and large-fruited crab apples. Although the moth control in these crops are not necessary, it is important to realize that the larvae from these crops could migrate into nearby apple and pear trees. The effectiveness of the Codling Moth control and management system is dependent upon the extension of the infestation, the climate, type of crop, and the attitude of the grower. It is necessary to implement these actions at the first sighting of the damaged crops. The Codling Moth larvae have higher tendency to infest fruit through an entry point from where the fruit is most covered, especially where one fruit is in contact with another. Fruit thinning will not only prevent the migration of larvae from the infested fruit to the other, but also it will provide better spray coverage for spray programs. Fruits that are already infested and still contain larvae should be picked and destroyed. The infested fruit could be identified by evidence of entry points. A successful interruption of the pupation dependent upon the coverage of the pupation sites. Removal of the debris sheltering the base of the tree can uncover the sites. The flaps of the tree barks of the older trees which could serve as ground for the larvae to overwinter into a grown insect, need to be destroyed. A traditional method that traps mature larvae in a cardboard band as they climb the trunk seeking a place to pupate. 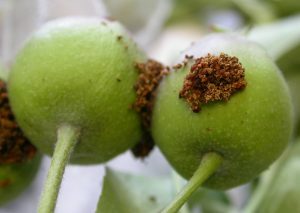 This method is effective on varieties of trees with smooth barks, such as “Red Delicious Apple” which do not provide alternative pupation sites, provoking the larvae to enter the trap. It is important to constantly check the traps consistently. If these bands are not removed and destroyed in time, it will enhance the extension of the infestation. paper bags. A slit cut in the bottom can allow the bag to be slipped over the fruit and the opening should then be stapled. Growing fruits with varietal differences that are firmer than the usual fruits will make them less susceptible for the moths to enter the fruit. These fruits can also be harvested sooner. Releasing of the tiny parasitic wasp Trichogramma platneri have been used to manage codling moth in combination with mating disruption or soft pesticides, especially in walnuts and pears. Conventional insecticides to manage the Codling Moths include products such as, Cabaryl, Imidan, Sevin, Acetamiprid, Permethrin, and Malathion. Moreover, Horticulture mineral oil, organic materials such as Spinosad, Entrust, and products such as Kaolin Clay, Intrepid (methoxyfenozide) and Esteem (pyriproxifen) with low toxicity could be used in lieu of or along with strong toxins. Codling moth pheromone traps are important for monitoring flight activity of moths to help time insecticide treatments. These will attract only males and have no effect on the females. The usage of Bug Zappers by commercial growers have proven to be effective on both male and female insects. The disadvantage of using a Bug Zapper is that it might terminate large numbers of beneficial insects.